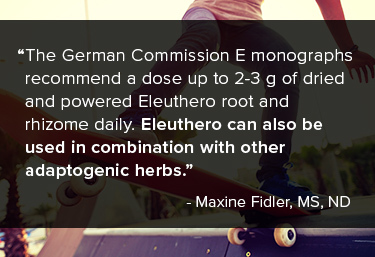 Eleuthero was previously known as “Siberian ginseng,” as it was native to the area where the studies occurred, and from the same family as Panax. Upon further study, it was determined that Eleuthero did not contain ginsenosides (considered the adaptogenic constituents of Panax), but instead contained glycosides with similar properties. One of the first to study the biology of stress, endocrinologist Hans Selye wrote of General Adaptation Syndrome, commonly referred to as the stress response, and its effects on the hypothalamic-pituitary-adrenal (HPA) axis. For more information and recommendations on supporting stress response, download the HPA Axis Optimization Program. Maxine Fidler is a freelance medical writer in Middlebury, VT. She obtained her doctor of Naturopathic Medicine, and master of Acupuncture and Oriental Medicine degrees from Bastyr University in Kenmore, WA. In addition to writing, she is an adjunct professor at Community College of Vermont, teaching courses in life science and allied health. After several years in private practice, she now teaches and writes full-time. Davydov M, Krikorian A. Eleutherococcus senticosus (Rupr. & Maxim.) Maxim. (Araliaceae) as an adaptogen: a closer look. Journal Of Ethnopharmacology. October 2000;72(3):345-93. Bleakney T. Deconstructing an adaptogen: Eleutherococcus senticosus. Holistic Nursing Practice. July 2008;22(4):220-4. U.S.C. Title 21 - Food and Drugs. Gpogov. 2017. Available at: https://www.gpo.gov/fdsys/pkg/USCODE-2010-title21/html/USCODE-2010-title21.htm. Accessed March 26, 2017. Hu S. Eleutherococcus vs. Acanthopanax. Journal of the Arnold Arboretum. 1980;61(1):107-11. Chen J, Chen T, Crampton L. Chinese Medical Herbology And Pharmacology. 1st ed. City of Industry, Calif.: Art of Medicine Press; 2004. Yarnell E. Phytochemistry And Pharmacy For Practitioners Of Botanical Medicine. 1st ed. Wenatchee, WA: Healing Mountain; 2003. Seely D, Singh R. Adaptogenic potential of a polyherbal natural health product: report on a longitudinal clinical trial. Evidence-Based Complementary And Alternative Medicine: Ecam September 2007;4(3):375-80. Szabo S, Tache Y, Somogyi A. The legacy of Hans Selye and the origins of stress research: a retrospective 75 years after his landmark brief "letter" to the editor# of nature. Stress (Amsterdam, Netherlands) September 2012;15(5):472-8. Panossian, A,. and Wikman, G. Evidence-based efficacy of adaptogens in fatigue, and molecular mechanisms related to their stress-protective activity. Current Clinical Pharmacology. 2009;4(3):198-219. Goldstein D. Adrenal Responses to Stress. Cellular and Molecular Neurobiology. 2010;30(8):1433-40. Gaffney B, Hügel H, Rich P. The effects of Eleutherococcus senticosus and Panax ginseng on steroidal hormone indices of stress and lymphocyte subset numbers in endurance athletes. Life Sciences. December 14, 2001;70(4):431-42. Gaffney B, Hügel H, Rich P. Panax ginseng and Eleutherococcus senticosus may exaggerate an already existing biphasic response to stress via inhibition of enzymes which limit the binding of stress hormones to their receptors. Medical Hypotheses. May 2001;56(5):567-72. Hoffmann D. Medical Herbalism. 1st ed. Rochester, Vt.: Healing Arts Press; 2003. Therapeutic Research Center: Siberian Ginseng. Natural Medicines. Somerville, MA: Therapeutic Research Center. Date last modified October 6, 2016. Aslanyan G, Amroyan E, Gabrielyan E, et al. Double-blind, placebo-controlled, randomised study of single dose effects of ADAPT-232 on cognitive functions. Phytomedicine. 2010;17:494-9. American Psychological Association. Stressed in America. 2017. Available at: http://www.apa.org/monitor/2011/01/stressed-america.aspx . Accessed March 27, 2017.